The Winter Solstice is a real good reason to celebrate! 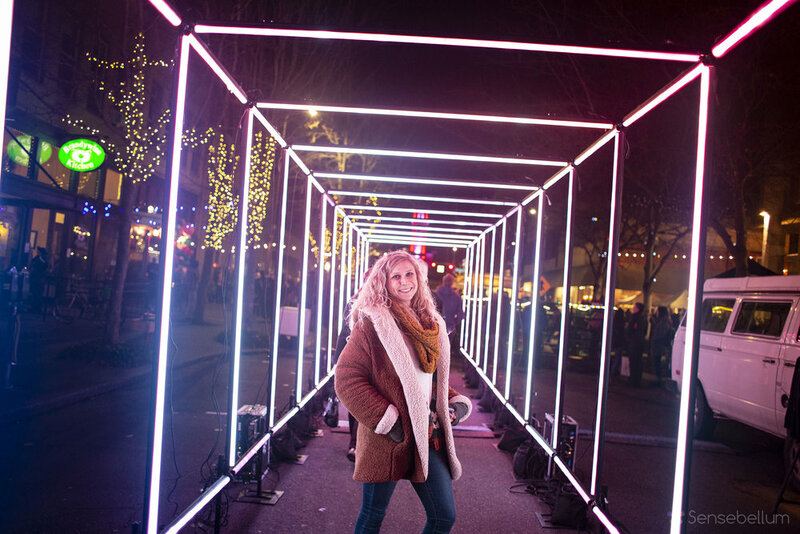 No matter your latitude the longest night needs just a bit of light at the end of the tunnel and that we did via 12 sections of structured LED for the Bellingham Commercial Street Night Market - Solstice Edition this last December. By using a heap of our signature CUBIX LED Bars we created a literal tunnel which served as part entry and exit to and from the event. As patrons filed into the immersive experience each bar twinkled and shimmered in full color anticipation of all the fun festivities inside. The tunnel was engineered to be just wide enough for lots of people at once , just the right for all - even with a kid on your shoulders, as well as visible from throughout at every angle. The LED Tunnel is all weather ready for conditions sunny, hot, cold, and wet. To boot it sets up in mere hours and can run all night. Ask about our special interactive integration for even more incredulity upon introduction.